Barcelona coach Ernesto Valverde has left forward Lionel Messi off his squad for this weekend's Spanish league match, giving him more rest before the visit of Manchester United. Messi and Sergio Busquets were both dropped by Valverde for Saturday's match at Huesca, which is in last place in La Liga. 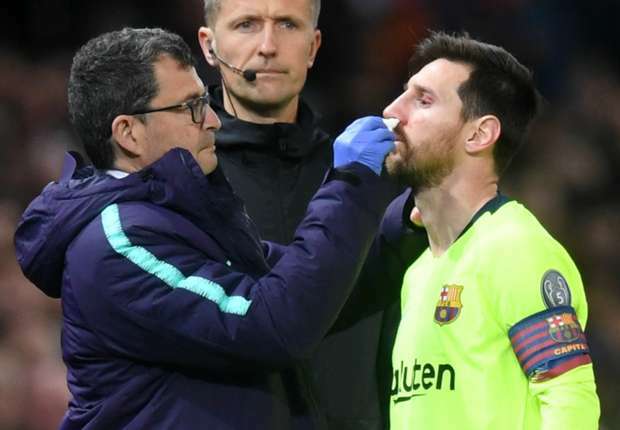 Messi had his nose bloodied when he was hit in the face by United defender Chris Smalling during Barcelona's 1-0 Champions League win at Old Trafford on Wednesday. Valverde said on Friday that the knock had left Messi in need a break. "I spoke to him and he is fine, but it was a hard knock," Valverde said. "He wasn't feeling good the day after nor during the rest of the match. It was like a truck had run over him." Luis Suarez and Gerard Pique will miss the Huesca match due to suspensions, while Sergi Roberto will rest to recover from a muscle strain in his left leg. Ivan Rakitic won't travel because he has a fever, the club said. Barcelona leads the Spanish league by 11 points with seven games left. The defending Spanish champions host United on Tuesday in the return leg of their Champions League quarterfinal.